Like several churches in this part of the world, St Martin was in a very bad state by the 19th century, with only part of its nave still in use for worhip, and the decision was made to rebuild it. 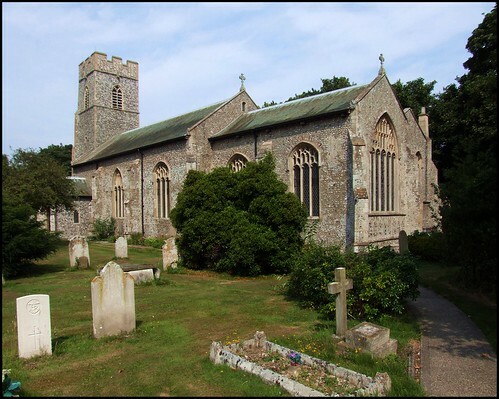 It seems to have been a north Norfolk fashion to rebuild on a new site, and so when Christ Church was erected in the churchyard beside St Martin in 1867, St Martin was left as a picturesque ruin. However, in 1883, Clement Scott eulogised this area in an article written for the Daily Telegraph, and the legend of Poppyland, a dreamlike English idyll, was born. The north Norfolk coast became a popular holiday destination, thanks to Scott's writing and the opening up of the area by the railways. Perhaps a characterless Victorian church did not fit in with Scott's vision of what Poppyland was, and what people might find there. The medieval parish church at neighbouring Sidestrand had been rebuilt on a new site in an entirely medieval round-towered style, and so it was that Christ Church was demolished, and the ruin of St Martin restored to something approaching its former glory. The architects were Cecil Upcher and AJ Lacey, and the church was opened on the eve of the First World War. The reconstruction coincided with the pre-War triumphalism of the Church of England, which was at that time at its highest point in the national consciousness, but the project demanded a rigorously vernacular style, and so too many excesses were avoided. The guardian angel in his niche on the south side is not a taste of things to come, because you step into a relatively plain and simple interior which is full of light from the clear glass windows. The only colour comes from a vibrant east window depicting Christ in Majesty with St Cuthbert and St Martin. The aisle and chancel are by Upcher & Lacey, the north doorway surviving to create an unusual opening between aisle and nave. Mortlock says the current south porch was originally on the north side. Arthur Mee says that the old font was found in a garden. Although Overstrand is in many ways still a remote backwater, the memorials and headstones here record links to some of the 19th century's most significant philanthropic families, including members of the Buxton and Gurney families as well as Lady Battersea, who was one of the Rothschilds. Sir Thomas Fowell Buxton was the millionaire owner of Truman's brewery. He married Elizabeth Fry's sister, and as MP for Weymouth and the Isle of Portland he spoke strongly in parliament for the abolition of all slavery, even after the ending of the slave trade. It is said that his advocacy of the extension of liberty in Africa through the influence of legitimate trade under the protection of Christianity inspired the Scottish doctor, David Livingstone, to go to Africa as a missionary. Tragedy haunted Buxton and his wife Hannah: four of their children died during an outbreak of whooping cough in the early spring of 1820. Buxton himself never came to terms with his failure to eradicate slavery from Africa; he died in 1845, and was buried here. His memorial is inside the church, but he is also to be found on a recent British five pound note, where he is the spectacled figure standing to the left of his sister-in-law, Elizabeth Fry.